So the past few weeks have been kinda crazy. I had made a long list of plans about all the things I would do and catch up on once my internship was done, but I haven’t done many of them. Why, you ask?. Because The Muslim Girl has pretty much taken over my whole life. If I’m not blogging, I’m trying to promote the site on Facebook, Twitter, Instagram, Pinterest, etc. Managing all of those accounts, plus my personal ones has been kinda crazy (and I’m kind of losing my mind -_-). Add on this the fact that my grandma, who lives with us, had surgery a few days ago, and the general distraction that is my home, and I haven’t been getting much done. 🙁 The new book that I was supposed to finally start writing this summer remains trapped in thoughts in my (foggy) brain and books remain untouched on my bedside table, since apparently I’m too distracted to even read. As some of you might know, I’ve got a long list of things I want to try and make this summer, known as my Summer Food Bucket list on Pinterest. This recipe wasn’t technically on the list. I only discovered it a few days before I made it. I saw the picture on Pinterest and knew I had to make them right away! Described as outrageously chocolatey, with a cake-like texture, I knew that all my other recipes would have to wait while I made this one. And I’m so glad I did! 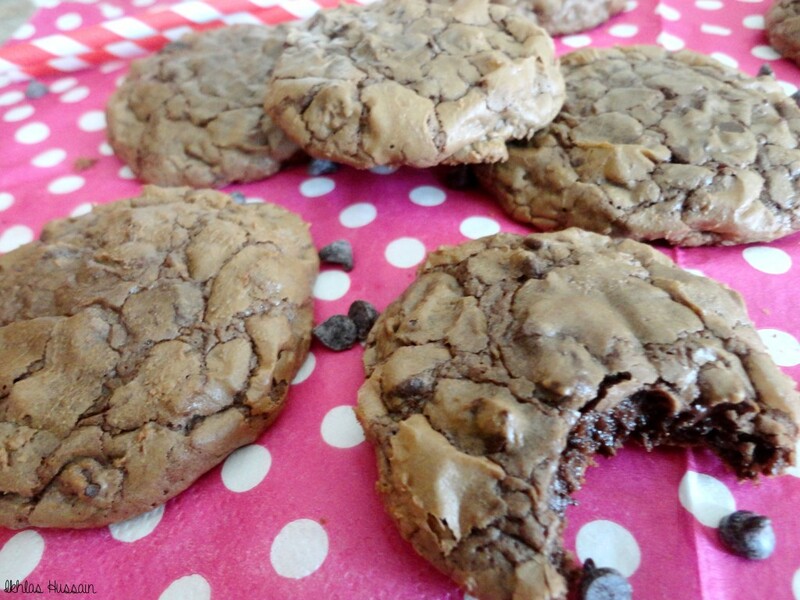 Crinkly on top, with an ooey-gooey centre, these Crinkly Chocolate Cookies were a hit! Check them out! In a medium microwave safe bowl, melt butter and 1 cup chocolate chips in 20 second increments until just melted. Stir to melt completely and set aside. In the bowl of your stand mixer, beat eggs, brown sugar, and vanilla on high speed. Reduce speed and add melted chocolate. Add in flour mixture slowly, scraping the sides of the bowl occasionally. Add chocolate 1 1/2 cup chocolate chips. Refrigerate dough for at least one hour. Preheat oven to 350 degrees and line a baking sheet with parchment paper. Set aside. Scoop out chilled dough and set on baking sheet. Flatten slightly with the back of a spoon. Bake for 4-5 minutes, and then turn trays and bake for another 4-5 minutes, or until centres are slightly set. Let cool completely before enjoying. Store in an airtight container. Original recipe from Julia's Album. 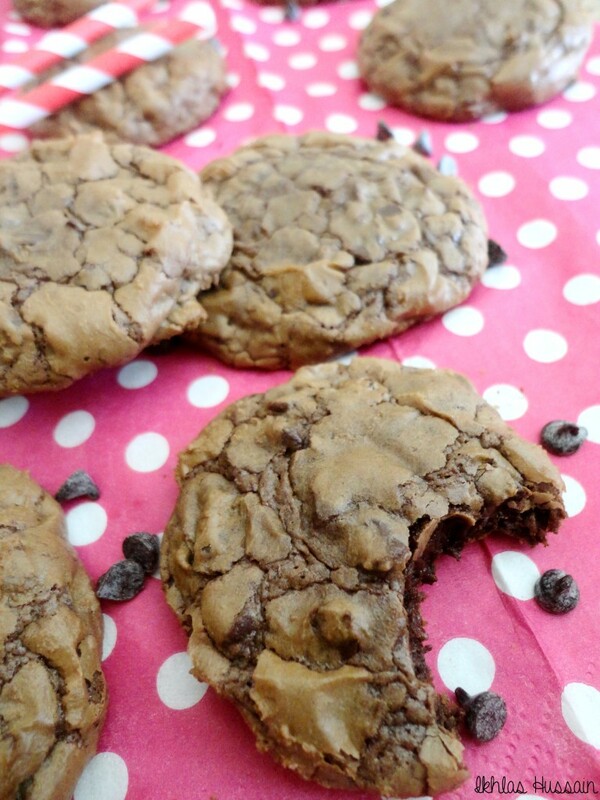 The trick with these Crinkly Chocolate Cookies is the melted chocolate. 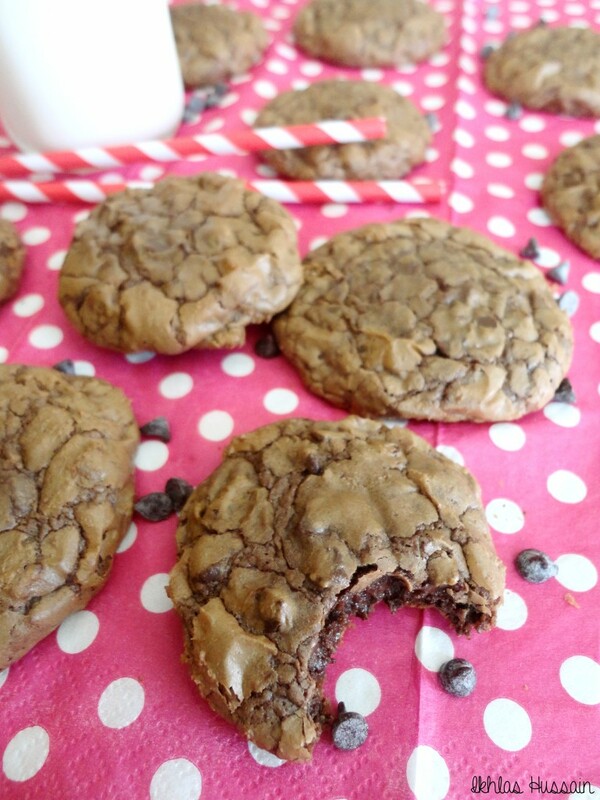 I’ve never used melted chocolate in a cookie recipe before, but boy, can you taste it! The cookies are incredibly chocolatey and the melted chocolate provides a richness and depth of flavour. It’s important that you don’t burn the chocolate when melting it in the beginning of the recipe. Melt the butter and chocolate until it’s just melted, with some solid chips still visible. Stirring it for a minute will melt the chocolate completely. You don’t want your chocolate to be too runny, so it’s important to do this in the beginning so the chocolate has time to set and cool down. I also found that the dough was too soft so I decided to refrigerate it, which solidified the dough nicely, which ensured thick, puffy crinkly cookies. 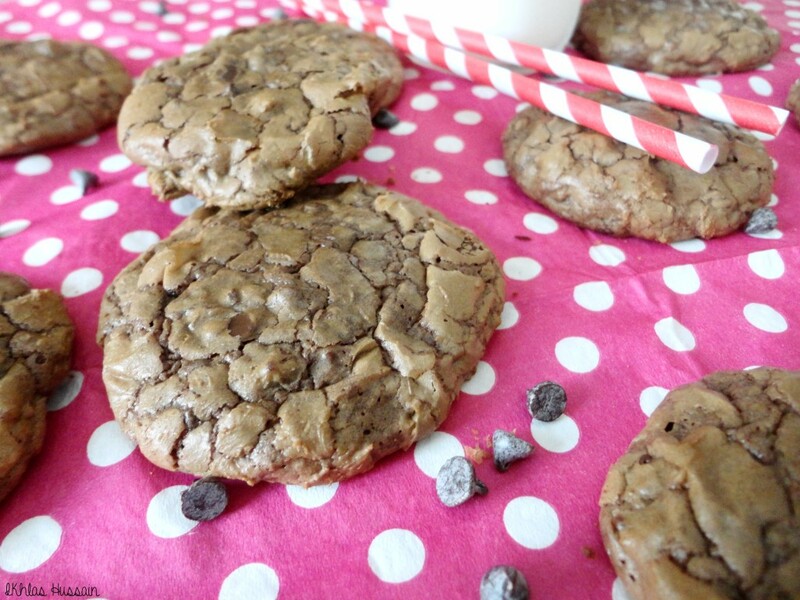 These crinkly chocolate cookies are best eaten a few minutes after they’ve come out of the oven, with the chocolate chips melting in your mouth and running all over your hands. 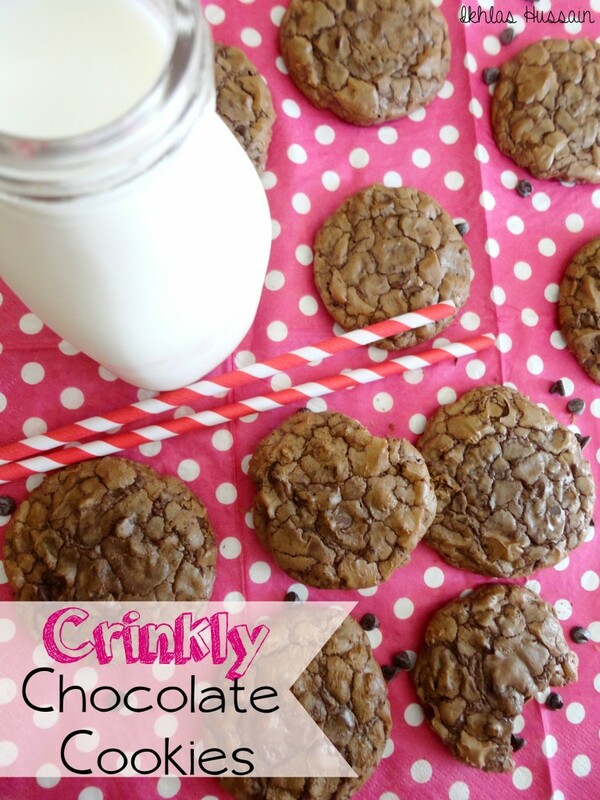 Paired with a tall, ice cold glass of milk, these cookies are perfect for chocolate-lovers! These look so good! I love a nice gooey cookie! I’m fasting today and looking for the perfect dessert to eat later and these just may be it. It’s funny we follow each other on pinterest, and you always pin my cookie recipe but girl these look better than anything I’ve pinned lately. Aww thanks, Mae! 😀 Glad you like them! Nom Nom Nom! Can I just hire you to be my personal chef? All of your food always looks soooooo delicious!! Natalie recently posted…Atwood Is Coming To HBO!